All faiths are welcome to our sites. 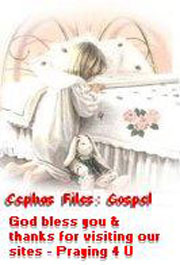 Greetings and peace unto you, in the name of our Lord and Savior, Jesus Christ. Amen. Thought for the day: Did you know that Christianity is the only religion in the world, in which their works do not save them? It is by grace that they are saved, it is a gift from God. For the Christian, the death of Christ was the perfect blood atonement for all who have sinned, because Jesus was without sin. Amen. SINCE THE KJV (ALL VERSIONS) HAVE MANY WORDS THAT ARE NOT ORIGINAL DUE TO WHAT THEY CALL THE MANDELA EFFECT (M.E.) WE CANNOT BE MADE RESPONSIBLE FOR ACCURACY OF SCRIPTURESES. THERE IS NO ORIGINAL TO BE FOUND ANYWHERE. Consider this website to be a LIBRARY as well as a ministry to people who are involved in cults or false doctrines. Most of the files offered are written by researchers other than ourselves, and as a Public Library does not back their literature neither do we. If you are a born again believer, Scripture states that we should study the Word of God (KJV) and not listen to men. (1 John 2:27; John 14:26, Col. 2:8, 2 Tim.3) That has born itself out over and over in our journey. We expect you to get involved and research as well as using common sense and Biblical understanding. This website is about fully documenting that the Bible prophecy of the Dragon, the Beast, and the False Prophet from Revelation 16:13-16 are true. Learn how the world is falling into more and more spiritual darkness giving way to to Mammon (money) which requires pluralism, in other words all religions become one big family. To establish an international Market that no one will want to topple because everyone is promised benefit from it, the scourge of religious infighting has to be brought under total control . Fundamental Christianity is the only religion that will not submit to Mammon (Matthew 6:24) because it cannot give up on Jesus Christ, their Savior, who is the only ONE who can grant eternal life in heaven. The attack on the World Trade Center and the military seat, the Pentagon, was a most effective tool Satan used to further his agenda of bringing all religions and state together publicly in his pursuit of a replay of the tower of Babel which spells "undimished power", in the hope of overcoming God. After all isn't that Satan's end goal? We believe that God intervened to lighten the blow. The whole evil plan was not accomplished. The Holy Spirit is still active in Christians. He inspired Christian men and women who are in charge of our money to have a parallel systems in place to reopen the Stock Market in a very short time considering the extent of the damage. We wrote this paragraph soon after the attack. Many unanswered questions have arisen about the attack at this point. The top four floors of one of the towers had been evacuated and the fact that a parallel system was in place becomes another question. Endtime ministries are losing sight of the big picture: the "Woman On The Beast," and the False Prophet. The Stockmarket is represented by the "Bull." Mystery Babylon The Great, The Mother of Harlots And Abominations OF THE EARTH. Many discard the notion of the United Nations having an influence in this picture, when it represents the unity of nations and religions. "The waters which thou sawest, where the whore sitteth, are peoples, and multitudes, and nations, and tongues. Jerusalem sits on seven hills and is divided into three parts: Christians, Israelis and Muslims. God's anger goes back to Solomon who had 1,000 women and was the wealthiest man on earth. He got involved with false religions and worshiped other gods. "And the Lord was angry with Solomon, because his heart was turned from the Lord God of Israel... and had commanded him concerning this thing, that he should not go after other gods: but he kept not that which the Lord commanded." (1 Kings 11:9..10) Solomon's temple was destroyed. Isaiah 54:4-8 is the reason why the ten horns in Revelation 17:16 hate the whore, a name they gave her. "And the ten horns which thou sawest upon the beast, these shall hate the whore, and shall make her desolate and naked, and shall eat her flesh, and burn her with fire." Israel has not repented to this day. They are part of the global market and the Interfaith church. They wish to be accepted in the U.N. as full fledged members. Many Jews have intermarried to neutralize their heritage. There are few Christians left in Israel. To 'born again believers' the time has come to suffer true persecution. We have always had to contend with slights but today it will not be just slights. The traditional church has been destroyed. The new apostles are in command teaching that we should unite and embrace all denominations including Islam and be in agreement with sinful behavior, in the name of patriotism. The churches are draped in American flags to remind members of their duties as American citizens. See the crosslinks in our files between the Roman Catholic Church, the ecumenical movement that now permeates all denominations, Unity in Diversity, the Interfaith Movements, and the United Nations. 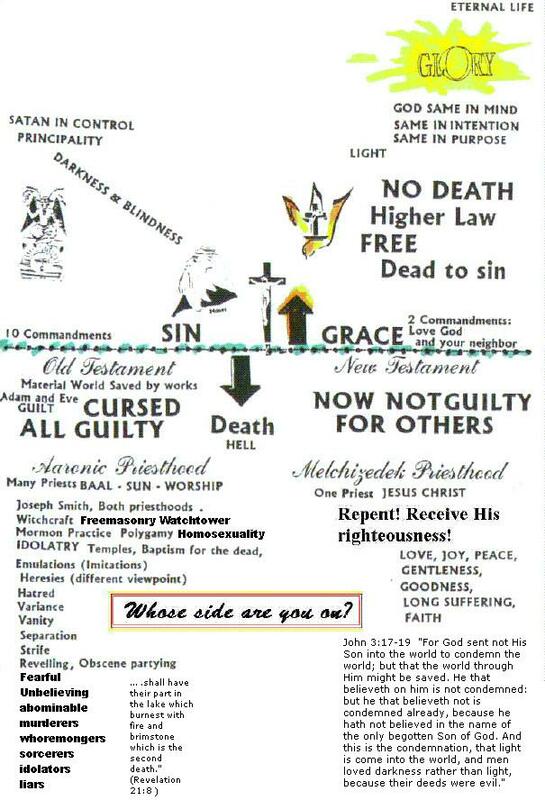 The Interfaith Unity in Diversity is anti Christ. Believers cannot be unequally yoked. leaving the Biblical Christ Jesus out! This ministry began in 1992. 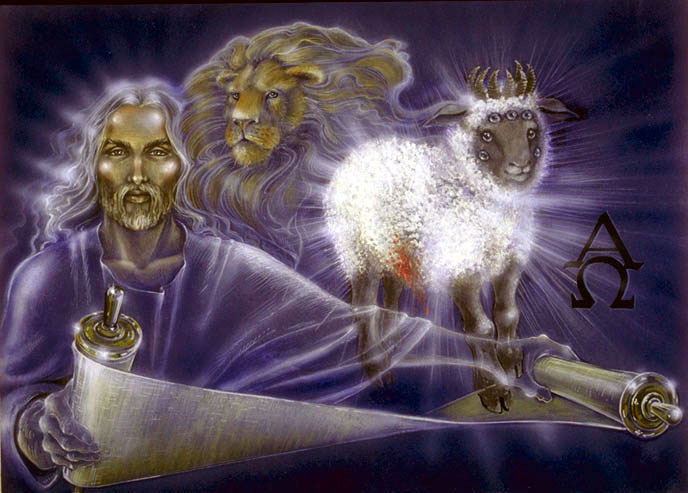 Today, November 1, 2014 this prophetic expression by the artist is coming to pass. Believers are expected to conform to new laws that they can't comply with if they wish to go to heaven. Anti-Semitism is rekindled. Israelis are expected to comply with President Obama's wishes of giving up the little bit of land that they occupy. The once friendly nations have turned against them once again. "Verily, verily, I say unto you, That ye shall weep and lament, but the world shall rejoice: and ye shall be sorrowful, but your sorrow shall be turned into joy. "A woman when she is in travail hath sorrow, because her hour is come: but as soon as she is delivered of the child, she remembereth no more the anguish, for joy that a man is born into the world. "And in that day ye shall ask me nothing. Verily, verily, I say unto you, Whatsoever ye shall ask the Father in my name, he will give it you. "Hitherto have ye asked nothing in my name: ask, and ye shall receive, that your joy may be full. These things have I spoken unto you in proverbs: but the time cometh, when I shall no more speak unto you in proverbs, but I shall shew you plainly of the Father. "At that day ye shall ask in my name: and I say not unto you, that I will pray the Father for you: For the Father himself loveth you, because ye have loved me, and have believed that I came out from God. "The sun shall be turned into darkness, and the moon into blood, before the great and the terrible day of the LORD come. Please remember we have the "Blessed Hope" No Man Knows The Day Nor the Hour! The latest utterance from Pope Francis: Climate Change is a sin by humanity. 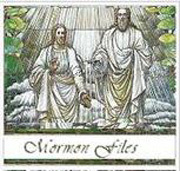 You can receive atonement if you recycle and car pool. By the way according to him everybody goes to heaven and to have a personal relationship with Jesus Christ is dangerous. Friends: Things are changing rapidly now and I will keep you up on what's happening to the ministry at Cephas Live Media ! The original website was shut down by ??. "God Commandeth all Men (Women) everywhere to repent"